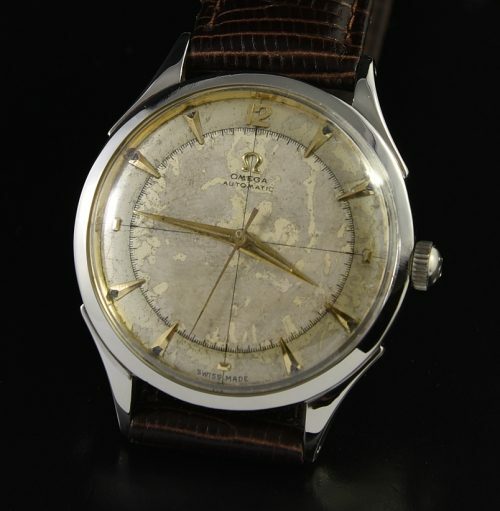 This oversize OMEGA dates to 1951 and is highlighted with its all dial appearance due to the large 35mm. stainless steel case with screw back. The inwardly curved lugs extend to 42.5mm. You know by now, I love original dials with age and character-this one truly has it. The raised gold toned markers and Dauphine hands are sealed in by an authentic OMEGA hesalite crystal. The aging looks much more subtle with the naked eye. Remember, I photograph these up-close and brightly lit. The early bumper-automatic caliber 351 OMEGA movement was just cleaned-accurate. The OMEGA winding crown is present. You will love this slightly larger-than-average OMEGA.